Soon after I arrived in India, I visited Balaji in Chennai and met the folks of the Tamil Nadu Science Forum which took Balaji by storm (or was it the other way around?) There I heard Ambarigi, Shanthi and other workers talk about the value of sattamavu, or ragi, sprouted and ground and easy to make into porridge. They focussed on encouraging parents to prepare it for young children and asked us and other well-wishers to help promote it by sponsoring a year’s worth of sattemavu for a family in need. This Ravi and I did and later started a program to distribute ragi in Srikakulam as well. It was not until six months after our daughter was born that we bought the stuff to make and eat ourselves. As it turned out ragi porridge was an instant hit and we have been making it ever since. I didn’t venture further in the millet department until a couple of years ago when I started using every variety of millet I could find. Ragi, or finger millet was a regular part of our diet in the form of porridge. What to do with the other kinds? I tried them out in idli and dosa batter and they were great. Soon I was making idlis and dosas out of Proso Millet, Kodo Millet, Little Millet and Pearl Millet (bajra). I also made pulihara out of Foxtail Millet. But what about Finger Millet? The recipes I found for ragi idli and dosa called for ragi flour. I wanted to use whole ragi. Could I soak and grind it along with urad just like I did with all the other kinds of millet? I asked the farmer at the market where I bought the millet. He wasn’t sure. So I was on my own. When making idlis with rice I usually use 1 cup urad and 2 cups rice. I have been using the same proportion when using millet in like of rice. Since it was the first time making the idli batter with ragi I decided to use ragi along with other grains – rice and little millet (sama) in this case. I used up the little millet before I could take a picture so the following photo, showing only whole urad, brown rice and whole ragi is an example. It will work. Next time I get more little millet (sama) I will make it again and add a photo here. Rice, ragi and urad ready for soaking and grinding into idli / dosa batter. So as far as take 1 goes, the dough rose well and made fine idlis as well as dosas. In short, it was a success. 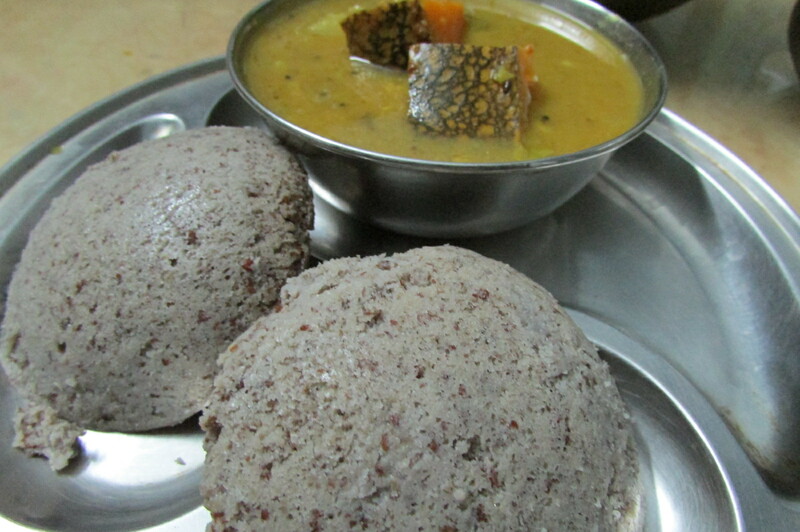 Idlis made of ragi (finger millet), sama (little millet), rice and urad (black gram), served with sambar. The instructions are quite simple. 1 cup whole urad or urad dal. Do not remove the peel. Note: Instead of rice you can easily use little millet or kodo millet. You can use the same batter for dosas, slightly diluting with a little extra water if you wish. Flip side of the Ragi-Sama Dosa. Urad and Ragi (Black Gram and Finger Millet) ready to soak for idli and dosa batter.